JVNJ01	| Write the first review! 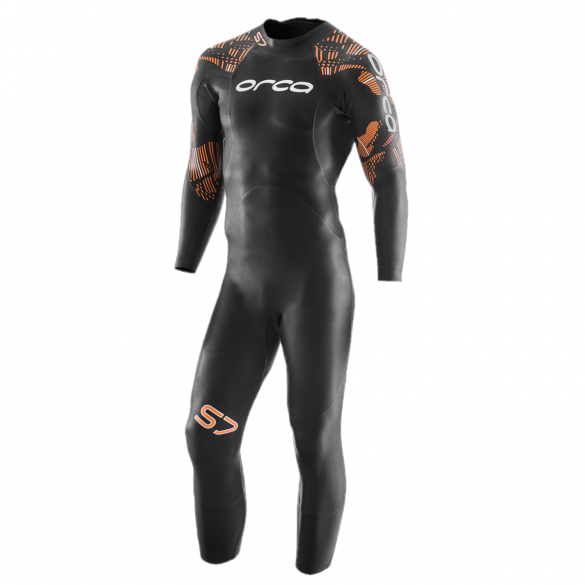 Get a head start Orca S7 full sleeve wetsuit men, this is an entry-level open water swimming wetsuit that won't let you down. 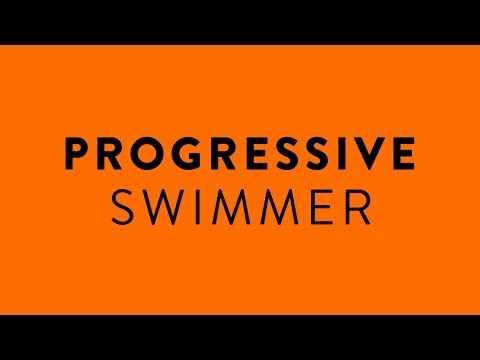 The S7 is an alternative to the 3.8 for the Progressive Swimmer. This type of swimmer needs extra buoyancy, so the S7 was designed to elevate the position of the triathlete in the water without compromising elasticity when it comes to swim strokes. The perfect tool to make sure swimming doesn't slow you down. Your discount €19,05	(21% VAT included)	New! On stock! Call me> You want to order by phone or have a question? We will call you right back! The SCS coating on the neoprene, typical of high-end suits, reduces friction and helps to increase speed. Its micro-cellular structure repels water and creates less restriction when moving forward. The S7 corrects your positioning, elevating you as much as possible. The 5-mm thick neoprene, used in the hips and legs, helps keep your lower body at the surface at all times. The 3-mm thick panel, located on the chest, prevents your body from swaying due to improper breathing. The lining in the neck area reduces friction and the likelihood of chafing. The material is soft to the touch and better for contact with the skin. The 2-mm Yamamoto panels, with 39- cell SCS lining on the forearms, shoulders and arms, combined with a flexibility liner, maintain mobility and improve flexibility. There are no reviews yet, write the first review now! The Bodyglide Anti chafing stick original 42g reduces friction, e.g. on feet and prevents arisal of blisters. Also skin irritation on thighs and bottoms will be decreased. Skin is supported in regenerating of chapped or cracked spots. Contains no oils, wipeable with soap. Huub Aegis III 3:5 wetsuit black men: the descendant of performance and value. The Aegis family of suits deliver more than the price, takes that expectation and delivers more. 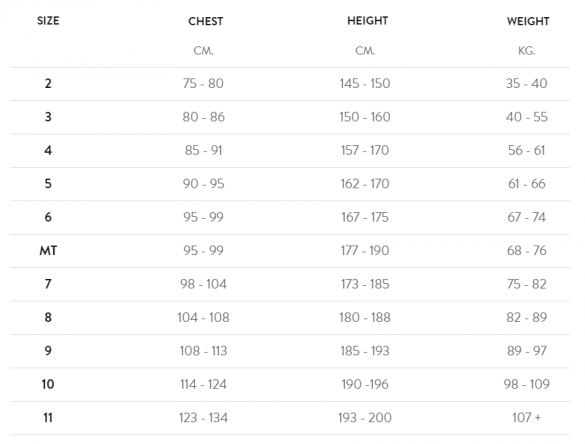 Features only seen on the Archimedes product line now appear on this price point defining suit. It was the goal of the team to create a suit that gives a true Huub experience at a price that is accessible. Huub improved the Aegis in comfort, speed and usability. A suit offering full smoothskin and 3:5 ratio buoyancy, unrivalled 3mm neoprene for correct buoyancy level and all overbody flexibility. The Zone3 Vanquish fullsleeve wetsuit women truly shows the laser precision and innovation which goes into the Zone3 product range. Over the last two years the Vanquish has built the reputation as the fastest and most comfortable wetsuit on the market and has been used and loved by thousands of amateur triathletes and swimmers as well as some of the best athletes in the world. Ironman distance athletes love the suit for its high levels of comfort and flexibility around the shoulders and Sprint/Olympic distance athletes for its speed and mega-buoyancy. 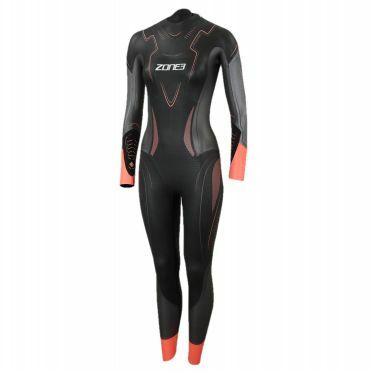 The Blueseventy Reaction wetsuit women has been improved with a more flexible upper body and new, thinner lower leg panels for quicker suit removal. Add to that a low neckline and VO2 chest panels, and you’ve got a suit that delivers everything you need in training and racing. Every aspect of this suit is designed for high performance without sacrificing comfort. Since it’s introduction in 2006 the Reaction has helped more athletes accomplish their goals than any other wetsuit. 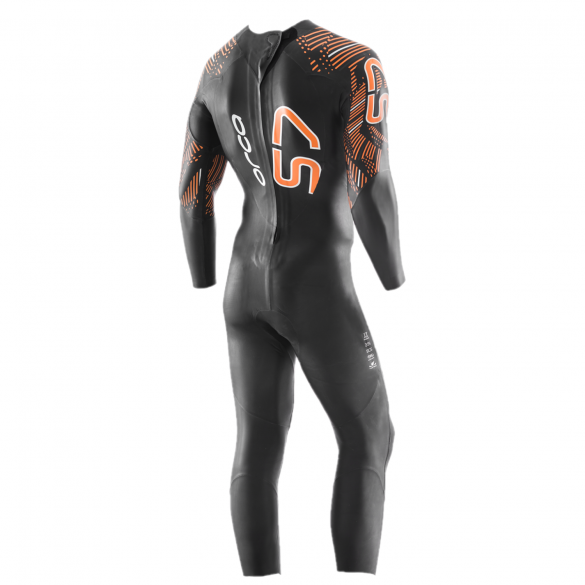 Confront the challenge of cold open water in the classic Arena Triathlon wetsuit men. Constructed of neoprene bonded to nylon, this triathlon design delivers boosted buoyancy with strategic chest and back panels. To cut down on drag the suit is coated with polyurethane. The reverse zipper facilitates quick exits and fast transitions. Swim with total flexibility, be hydrodynamic in the water, rise to the top at optimal speed. 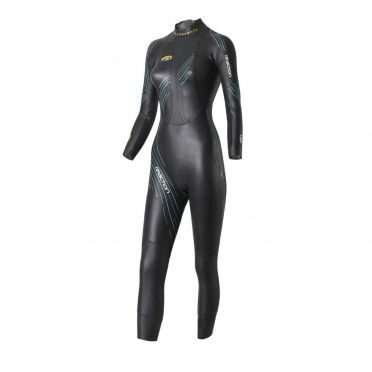 Fina approved: this Arena wetsuit has been approved by the Fina and is admitted at the national organizations.